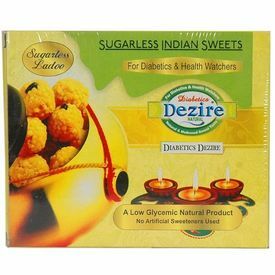 Diabetics Dezire sugarless laddu is made using Levulose - A natural sugar replacement. Low Glycemic and DOES NOT require Insulin for Metabolism. Hence suitable even for Diabetics. Clinically evaluated by leading diabetologists and patented. Tastes just like regular sugar, unlike other artificial sweetners.